YOSEMITE NATIONAL PARK, California -- An anonymous newlywed couple seen in a stunning photo taken in Yosemite and posted on Instagram has been identified. 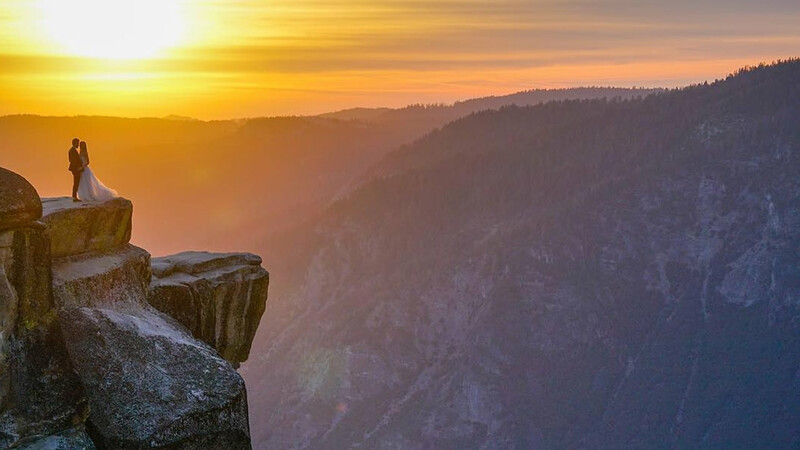 The photo that created a romantic mystery across social media, shows Rick Donald and Catherine Mack standing on top of a towering cliff in Yosemite National Park during a golden sunset. The picture perfect moment was captured by amateur photographer Mike Karas who was hiking last Thursday at Taft Point when he snapped the picture. He posted the photo online to try to find the newlyweds, in the hopes of sharing the gorgeous image with them and on Tuesday the mystery was solved. "Update, I just talked to the bride. She was laughing and happy about the photo and the whole story and loved it. She didn't know how big exactly the story had become. They both act. Their names are Rick Donald and Catherine Mack," Karas said. We shared it on our social media pages Monday and received responses on Instagram from two professional photographers -- Derek Copenhaver and Taylor Mccutchan - who said they were working with the wedding party and that the newlyweds preferred to remain anonymous at that time. Mccutchan wrote on Monday: "Heya! @derekcopenhaver and I were the videographer and photographer. At the moment, the couple wishes to remain anonymous as they would like to share the day with friends and family first." So, the mystery has officially been solved!